As a Fuji Electric distributor, NAC offers high power IGBT & MOSFET semiconductor solutions for larger, Inverter, UPS, and Motordrive applications. Fuji Electric offers a wide line-up of environmentally friendly semiconductor-based products ranging from power modules, which are an indispensable component in energy-saving power electronics, MOSFET, diodes, and control IC needed in high-efficiency power supplies. Their products are used heavily in low to medium voltage inverters, Wind/Power Generation, Welding Machines, Railroad, Solar Inverters, Un-interruptible power supplies for PC/Server applications, and automotive. 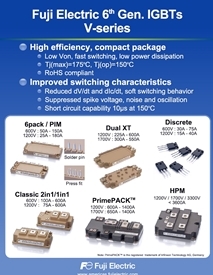 Fuji Electric has been developing IGBT modules designed to be used as switching elements for power converters of variable-speed drives for motors, uninterruptable power supplies, and more. IGBT has superior characteristics combining the high-speed switching performance of a power MOSEFT with the high-voltage/high-current handling capabilities of a bipolar transistor. Achieves smaller packaging and enhanced output power! SiC devices have excellent characteristics that realize high blocking voltage, low power dissipation, high-frequency operation and high-temperature operation. Power semiconductors that make use of SiC achieve significant reduction in energy consumption, and can be used to develop smaller and lighter products. Low IR Characteristics – Tj=175°C guaranteed, high temperature operation of power supplies, low loss, high efficiency. Fuji Electric has a lineup of power MOSFETs ranging from medium to high-voltage types with features such as low power loss, low noise, and low on-resistance. They have also developed the "Super J MOS®" Series, which adopts super-junction technology, mainly for 600V products. Fuji Electric offers a line-up of AC/DC and DC/DC power supply control ICs that support a variety of power circuits. 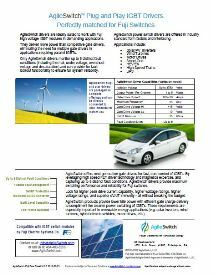 These highly efficient, low-noise products with low standby power consumption are compatible with environmental regulations. Furthermore, the many protection functions are built into the ICs themselves, allowing for smaller power circuits. Fuji Electric's rectifier diodes have features such as low VF characteristics and low IR, and are compatible with PFC circuits of power supplies and secondary-side rectification circuits.